Whether you work for a charity, or simply want to raise money for a cause close to your heart, we will work closely with you to agree your goal and make your charity firewalk a success. After you’ve booked your event, delegates secure their place by booking their tickets directly with you. You can set your event up for the right number of participants. You know delegates are committed to raising money for you and will show up on the night. Your charity firewalk will last 2 to 3 hours, depending on group size. They will be led through the preparation by one of our highly skilled seminar leaders, to identify obstacles that have held them back or that they want to let go of, before we make our way outside for the lighting ceremony. As the name suggests this involves crossing a 10-12 ft bed of glowing coals, bare foot. When your delegates tell potential sponsors what they intend to do, they will find sponsors easily, that’s why I’m confident saying that everyone will achieve their sponsorship level easily, and some will exceed it excessively! 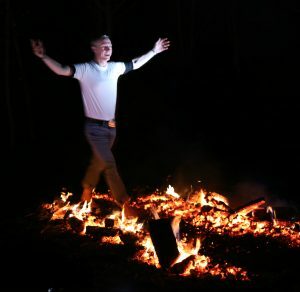 The whole charity firewalk event is framed around the things in life that we make more difficult for ourselves through our thinking, and the things we put off or avoid altogether because of our beliefs or the potential for a little discomfort. Everything we do on the night, including the firewalk, is a metaphors for these challenges.